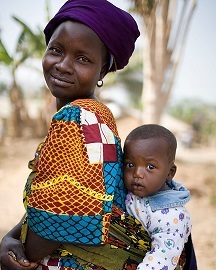 << In Côte d’Ivoire, some development programs were initiated since independence in the field of public health. They allowed to achieve some remarkable results. However, as time went on, due to the lack of financial resources and well trained specialized personnel, the issue of health became a major concern, especially in the rural setting >> (ref. here). This is even more the case in the most affected areas of the recent socio-political crisis. 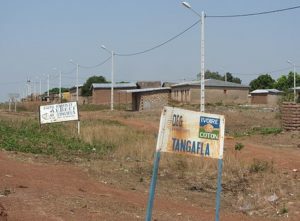 The village of Tangafla is located seventeen kilometers (17 km) east of the county-seat (sous-prefecture) of Niofoin and thirty-seven kilometers (37 km) west of the regional capital, Korhogo. Tangafla is situated on a paved road which connects Korhogo with Boundiali. 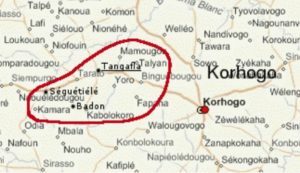 The region which would be most impacted by a health center in Tangafla includes eighteen (18) villages: Tangafla, Ogari, Djougoublé, Mamougou, Katégué, Yoro, Ziévogo, Kombolokoro,Badon, Ouayéri, Ouayéri-Djélisso, Tarato, MBia, Djoufouvogo, Yénissiguévogo, Binguébougou, Kamara and Séguétiélé (see the map to the left). This region is populated essentially by native Senoufo Tanga people, the majority of which are young and illiterate. Farming is the principal economic activity of this area and occupies 90% of the active population in these villages. They cultivate cashews, mangos, cotton, corn, rice, yams, peanuts, millet, sorghum, hot peppers, cabbage, lettuce, eggplant, and onions. There is also some animal husbandry mostly involving cattle and poultry. There is a bit of small commerce of food products and manufactured goods. The village of Tangagla has 1600 habitants. Including the populations of the seventeen (17) surrounding villages, a total of approximately 17000 persons will benefit from the care offered by a health center in Tangafla. Household incomes are unpredictable putting the people in a precarious financial situation since they depend mostly on agricultural activities. However, in this rural region farming is difficult because the fields are regularly destroyed by roaming domestic animals (cattle, sheep etc), and because the rains are variable from one year to the next with a total lack of water during the dry season. There are two government clinics, in Séguétiélé and in Kombolokoro, but they are minimally equipped and run by a government nurse without supervision of a doctor. Neither has a laboratory. Many patients are obliged to travel to Korhogo or to the Baptist Clinic in Torogokaha (42 km) by motorcycle or mini-bus in order to receive the care they need. Childbirth takes place at home without proper supervision. A health center in the village will permit rapid attention in case of emergency, assisted deliveries by qualified personnel, and assured care for chronic conditions as well as the availability of health teaching to promote good health. It would permit the population to save time and money on transportation. This center will permit an improvement in the state of health of the population, a lower rate of mortality and an improvement in the economic situation of the population. The health center will benefit from the competences of a doctor and a nurse. It will be equipped with a pharmacy, a laboratory and a delivery room with a room for observation of the newborns and their mothers. The construction of this health center will require a budget of 120’000 CHF. Your participation is essential in order for the desires of the Tangafla population to be satisfied. The villagers are impatient to see the center finished. They gave a portion of land beside the paved road and are eager to participate in the construction. Make a donation and help us meet this need of the population! Our association is recognized as a public utility in Switzerland. Therefore, your donations are tax-exempt.